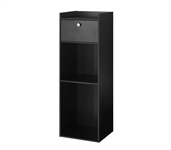 Here you will find plenty of dorm storage solutions to add to your dorm room decor and make college living better. From storage bins to Behind the door dorm room storage and dorm bookshelves, you will find everything you need to make your dorm room feel like a home away from home. Your dorm desk doesn't have upper shelves? Look no further than our College Cube, Classic Dorm Desk Bookshelf, or The Tower College Desk Textbook Shelf! You can even add our dorm storage bins and cubes to your dorm desk, dorm dresser or college closet to maximize the amount of dorm room storage you have! Don't settle for a cluttered dorm room - avoid having clutter by adding dorm room storage college supplies to your college dorm checklist! Our dorm bins, cubes, and shelves are college supplies that fulfill an organizational need for all dorm rooms. Dorm essentials like storage cubes, bins, and shelves are an effective and space saving way to store all your dorm stuff. Whether you keep these dorm organizers next to your Twin XL Bedding or by your Dorm Furniture or even on your college desk you know they will get used and keep you organized. Dorm space saving products that are highly functional are essential for creating a highly effective dorm room decor. Be smart when buying your dorm stuff and get what you need to make your stay in your university residence halls more comfortable.